Green seems to be the color of the day when it comes to Beyond Love. It’s a gentle, high-pitched tuberose fragrance that, if skimmed, seems like a relatively simplistic blend of green tuberose and light balancing florals. But a closer inspection yields a fragrance with a bit more depth and charge. In Bottle: Green, clean, and floral fragrance. It’s got that special slick bite that tuberose has to my nose with a definitively green aura of fragrance that makes me think of green and white flowers, bitter leaves and rain. There’s something a little musky hiding in the backdrop and what I think is the fabled ambergris rearing its whale upchuck head to sweeten and add complex appeal to Beyond Love’s so far pretty green tuberose petals. Applied: Instant payoff on the tuberose part as an entire bouquet of them blooms upon application with this bitter green note that sticks around for a few minutes before dissolving into the ambergris induced sweetness. I’ve lost any coconut that may have been present in the bottle and all I get now is tuberose with a gentle breeze of jasmine here and there. This is a bit of an interesting experience as the tuberose in Beyond Love is trying to convince me it’s a new, science fiction born tuberose that’s a cut above the rest and if misunderstood will go on a rampage to devour its enemies before it dies at the end of the day. Extra: By Kilian is a fragrance collection by the grandson of the founder of LVMH (Moët Hennessy – Louis Vuitton), Kilian Hennessy. LVMH being famous for its luxury items. Design: As I don’t actually have a bottle I can’t personally give details on the feel of the design. I will say, however, that no expense was spared to make sure By Kilian’s packaging was top notch. For what you pay for it (approx. 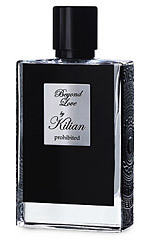 $220USD for 50ml of Beyond Love) the money has to go somewhere into the packaging. I see dark covered boxes, carved designs on the sides of bottles, travel holders that look more intricate than any travel holder has the right to be. These things have a look that tries its best to make you feel like the $220 you dropped was not in vain. Notes: Coconut, tuberose, jasmine, ambergris, musk. Despite all this, Beyond Love faded in a record two hours on my skin. The shortest wear time of any fragrance I’ve ever tried. But then I also only had a sample tube and that may have had something to do with it. Still, for how much it costs, I am leery to pick up a full size bottle unless I know I’ll get $220 worth of longevity. Again, this could be the fault of the sample vial I have and it may very well have excellent lasting power in a bottle. Reviewed in This Post: Beyond Love, 2009, Sample Tube. This entry was posted in floral, kilian, Reviews By House, soliflore and tagged ambergris, coconut, jasmine, lvmh, moët hennessy, musk, top notch, tuberose, white flowers. Bookmark the permalink.